The SZZT EPP ZT596F is the top-of-line encrypting PIN pad, offering manufacturers and integrators one of the most secure 3DES-compliant input devices available on the market. Optimized for usage in self-service kiosk, ATM, and self-payment gas pump. The ruggedized design of the EPP 596F are built to withstand the most severe fraudulent attacks while complying with payment security standards on the back end. 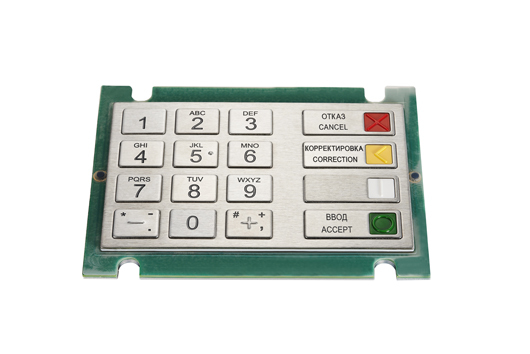 ZT596F features with Braille equipped, supports Remote Key Loading from SZZT, giving customers an open-standard, flexible on-line key loading solution that is more secure and cost-effective than traditional dual-control split knowledge key installation and maintenance. Access to top EPP security experts in industry through SZZT support. Welcome to purchase the PCI EPP For Kiosk Solutions with our professional China manufacturers and suppliers, and check the quotation with us. We will offer you the best after-sale service and fast delivery.